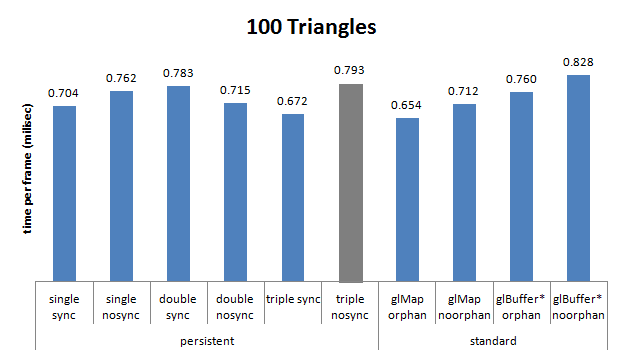 In part 2 of the article about persistent mapped buffers I share results from the demo app. 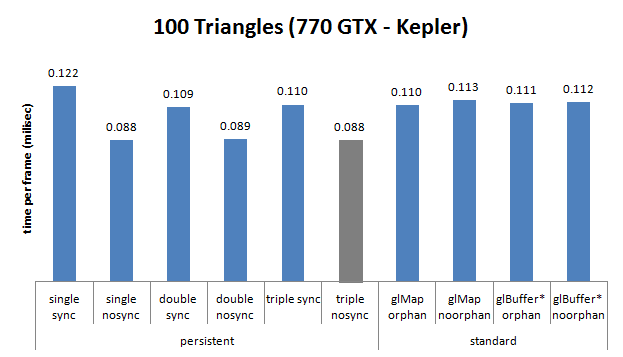 I've compared single, double and triple buffering approach for persistent mapped buffers. 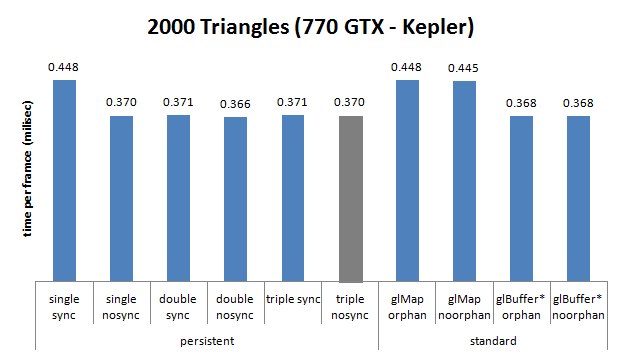 Additionally there is a comparison for standard methods: glBuffer*Data and glMapBuffer. 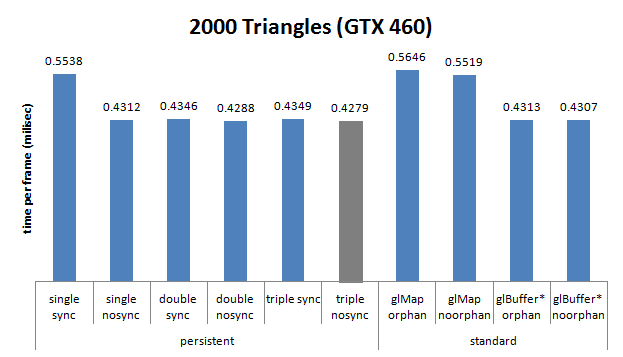 2k triangles uses: 2000*3*2*4 bytes = 48 kbytes per frame. This is quite small number. In the followup for this experiment I'll try to increase that and stress CPU to GPU bandwidth a bit more. for glBuffer*Data I call glBufferData(NULL) and then normal call to glBufferSubData. 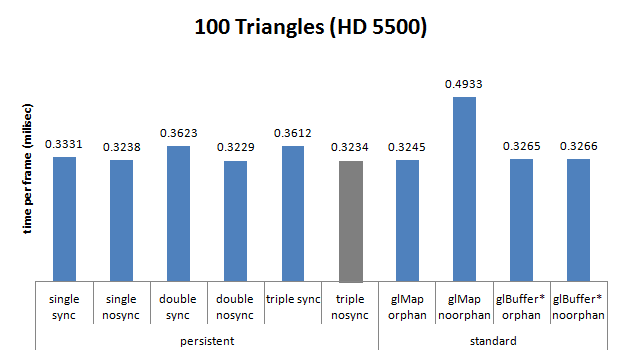 Persistent Mapped Buffers (PBM) with triple buffering and no synchronization seems to be the fastest approach in most tested scenarios. 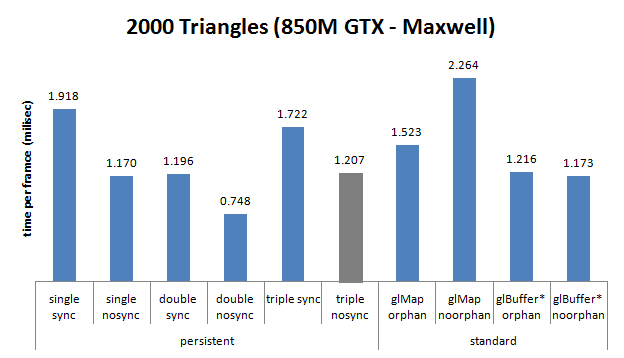 Only Maxwell (850M) GPU has issues with that: slow for 100 tris, and for 2k tris it's better to use double buffering. PBM width double buffering seems to be only a bit slower than triple buffering, but sometimes 'wait counter' was not zero. That means we needed to wait for the buffer. Triple buffering has no such problem, so no synchronization is needed. Using double buffering without syncing might work, but we might expect artifacts. (Need to verify more on that). 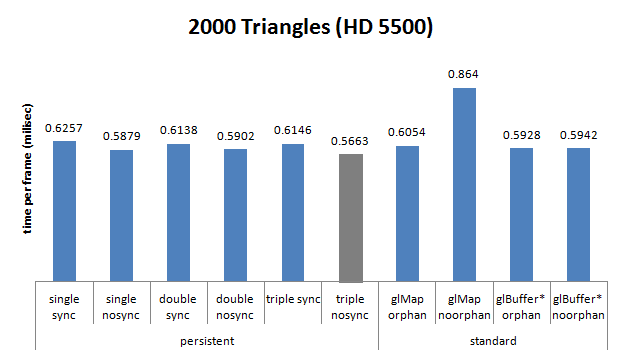 Single buffering (PBM) with syncing is quite slow on NVidia GPUs. 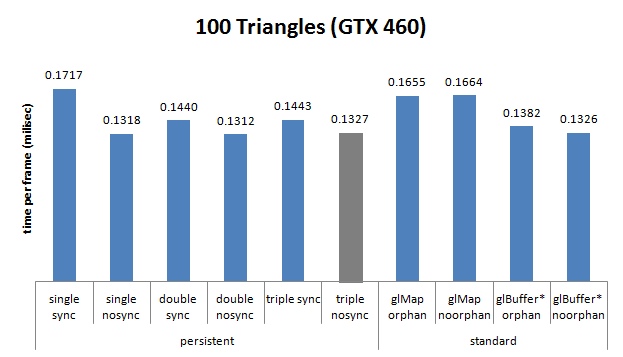 interesting that glBuffer*Data with orphaning seems to be even comparable to PBM. So old code that uses this approach might be still quite fast! If you like to help, you can run benchmark on your own and send me (bartlomiej DOT filipek AT gmail ) the results. Go to benchmark_pack and execute batch run_from_10_to_5000.bat. The test runs all the tests and takes around 250 seconds. If you are not sure your GPU will handle ARB_buffer_storage extension you can simply run persistent_mapped_buffers.exe alone and it will show you potential problems.